A tick is a small insect that clings to your body. Remove it as soon as you notice any on you. Why worry about ticks: most ticks are harmless. Moreover, we do not find them anywhere. The tick Ixodes dammini (attaches deer) is the size of a sesame seed, while the western black-legged tick is about the size of a poppy seed or a period (.). If you can easily see, this is probably not a tick Ixodes dammini. These may transmit a bacterial infection called Lyme disease. 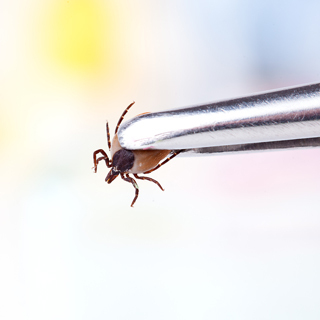 Lyme disease can be treated with antibiotics, which eliminate possible disorders such as arthritis and heart disease. Red lesion ring-shaped with a white center and surrounding the bite. Ticks are found in woodlands and fields, from May to November, but especially in June and July. You should walk the beaten path, if possible. If you are in an area where there is a risk tick clings to you, insert your pants into your socks and wear boots or sneakers, a shirt or long-sleeved jacket and a hat. Try to wear light-colored clothing and without reason to better see ticks. Use insect repellent (bug spray) containing DEET. THE PRODUCTS APPLIED TO THE SKIN OF CHILDREN SHOULD NOT CONTAIN MORE THAN 10% DEET. In addition, if you are pregnant, consult your physician before using such a product. Do not put repellent on the hands of a child, because it might put them in his mouth. When you go for good, wash with soap and water to remove the repellent. If you went to an area where ticks are many, you should change clothes and wash ones you removed. Check if you have ticks by examining your body from one end to the other. Examine your pets too. Each time you go into the forest, check if you have ticks. The sooner you take them, the less the risk of infection is high. To remove a tick, pull it gently with tweezers. You may save the tick in a bottle for us to do analysis if ever you have symptoms of Lyme disease. – If you experience symptoms during the three weeks of the bite (p. ex. red lesion ring-shaped, fever, fatigue or flu symptoms). Do not wait to be infested! For the extermination of ticks, call Groupe AZ Extermination. His professional inspection is free, effective and very fast.